Diary of a Miner: Day 67: Most dangerous game of 'Hide and Seek' ever! Day 67: Most dangerous game of 'Hide and Seek' ever! Last night was the longest night of my life! I was stuck up on top of the roof from late evening to early morning! I couldn't sleep for fear that someone would come up onto the roof, and I couldn't move in case I made a noise. I spent the entire night lying on my stomach, out of sight, hiding behind the seat I dragged up there ages ago! Like I had before back in the cell, I read through my diary and messed around with the camera for a bit. After the initial shock of nearly getting caught had worn off, I became very bored. I was looking into the distance in different directions with the zoom feature on the camera! In the end though, the sun began to rise and the fear came back. With the sun came light, and the ever increasing chance that someone will see me! I waited as long as I could allow to ensure that no-one would catch me. As far as I could tell, the guards would mainly be in and around the house during the night. 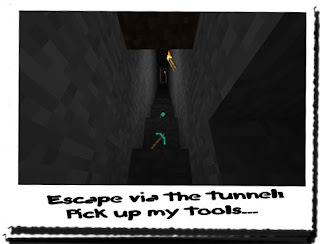 Escaping back into the tunnel would require more skill than gaining entry. And to make matters worse, I had to see if I could still dispatch the message I had begun... The guards couldn't have noticed otherwise I would have been caught by now! With a little less grace than Sam Fisher, I wiggled myself over to the hatch and stared down; there was no-one that I could see, and I was thankful this room had nothing of interest in it. After waiting a few moments, listening for any sounds, I opened the hatch and lowered myself inside. Instantly I lowered the latch and crept to the far side of the room, and hid behind a large chest. This was going to be my primary action whenever I entered a room, just in case. I waited there for a few minutes, hoping my breathing would slow and my heart would stop beating so loud! No-one came, so I crept to the door and peered round. URGENT MESSAGE! REQUEST IMMEDIATE ASSISTANCE! This is Syeonyx! I have irrefutable proof that I am attaching to this message, that I am not alone here! There is an evil group who are looking for me! I am in possession of a stone that can destroy active portals, and I believe it is that which they are looking for! I require full assistance from any forces you can dispatch by air within the next few hours! They need to be stopped before they find me and gain possession of the stone! If they do, then the portals can never be destroyed once activated! DO NOT RESPOND TO THIS MESSAGE! Repeat: I request a heavily armoured task force within the coordinates of my designated quadrant, to remove this threat from Minecraftia! DO NOT RESPOND TO THIS MESSAGE! I dispatched the message and re-enabled the screensaver. Putting the PDA back where it was, I went back to the door and took a look around the upper landing. There was no-one here at all! All I needed to do was get down into the basement and then down the coiled stairs to the barricade and I was home and dry! Then all I would have to do is wait for HoN Co. to dispatch a force to tackle them! There is no way they can accuse me of fabricating the truth now, I had picture proof that there were other people here with swords, and therefore an intent to harm! I've made it clear to them not to respond to the message directly, but to just send the task force. Any response would expose my plan, and me! I also left out my current hiding spot. If anyone decided to use the PDA, they may be able to recover the dispatched message and come looking for me. After a few moments of waiting at the top of the stairs, I slowly descended, careful to stop if I heard any noises. I got to the bottom and could see a shadow lying across the floor of the entrance! It wasn't moving, but I didn't want to spend too much time staying still. I quietly dashed into the weapons room and descended the ladder into the basement! Excellent! This was going better than expected! As I got to the bottom of the ladder, I heard voices, and footsteps! 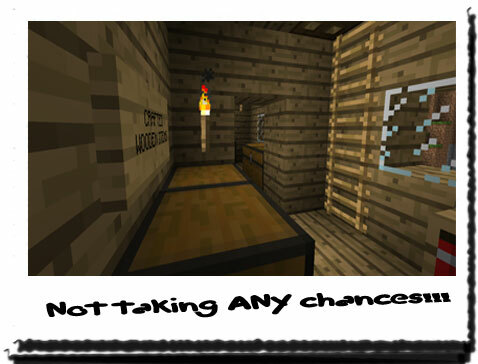 Without thinking, I ran into the treasure room and dived behind one of the chests! I sat there for a few minutes, hearing the steps grow louder as the guard ascended the coiled staircase... If I had ran straight down those, I would be dead by now! I waited, and then decided to pop my head up; just as I did, a guard walked past the door of the treasure room, and up to the house via the ladder! Phew! That was too close! What would I do? As I backed up, I was careful not to slip on the rails that lined the stairway. I had built it for efficiency so I could climb the stairs and push the carts at the same time. Then it hit me! That was a brilliant idea! I quickly walked up to the top where the track alternators were and saw a cart already loaded. As quietly as I could , I rolled the cart into position. With a lot of energy and effort, I pushed the cart down the steps, whilst I took a detour and went up the steps as though I was going to the surface entrance! I sat there for a moment, and then heard a crash followed by swearing! The guard came running up the stairs, shouting, and I took this opportunity to run down to the barricade. The cart had smashed a sizable hole in the barricade and then bounced back, still rolling slightly. I didn't wait, and quickly dived through the new hole! From here on out, I was practically free. All I had to do was get back to the ship's engine room and wait for the task force to arrive! 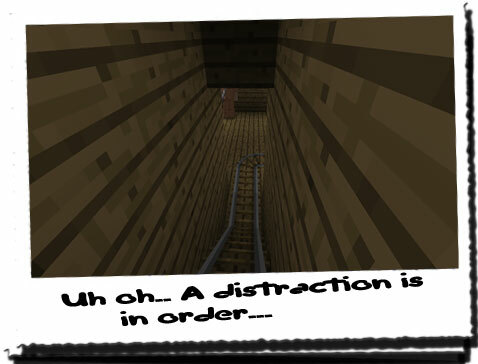 I ran down the wooden staircase leading to the mine and up to the dirt wall where I had concealed the tunnel. After a few minutes of scrabbling at the earth with my hands, I made a large enough hole to fit through. My tools were still there, and when I was through, I blocked the hole back up with the shovel, before attaching it to my back along with the pickaxe. I climbed onto the beach and hid behind the mound of sand, expecting there to be guards posted on the outside of the gate again. Peering around however, I saw no-one... Where were they? Shrugging, I crept out a little further, and looked up towards the towers, but still no-one... Where were all the guards? They weren't in the mineshaft, the basement, the house or around the wall... Maybe they were expecting me to either exit or enter through the rear gate... Fools! Now wasn't the time to be cocky; I wasn't home and dry yet! 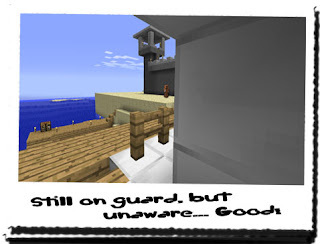 After making sure that no guards were lingering around on the wall, I dashed to the front of the ship and hopped over the railing. I then cautiously descended to the lower deck, and then to the engine room. Made it!